Charlie Asher is a pretty normal guy with a normal life, married to a bright and pretty woman who actually loves him for his normalcy. They're even about to have their first child. Yes, Charlie's doing okay-until people start dropping dead around him, and everywhere he goes a dark presence whispers to him from under the streets. Charlie Asher, it seems, has been recruited for a new position: as Death. It's a dirty job. But, hey! Somebody's gotta do it. Christopher Moore was born in Toledo, Ohio in 1957. He studied at The Ohio State University and at the Brooks Institute of Photography. 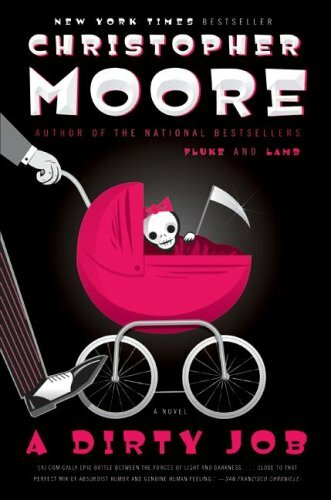 Moore's books include Demon Keeping: A Comedy of Horrors, a story about a demon-promised eternal youth, Bloodsucking Fiends: A Love Story, and Island of the Sequined Nun.